As you already know I am crazy over gold accessories. Bangles, bracelets, rings, necklaces, you name it. I love both basic and statement accessories, as the two of them are suitable for different types of events. I love how accessories can add sparks on my feminine and elegant look. The key to look chic is to invest on a classic accessories that will last for the next 5 -10 years or even more. Choosing a versatile accessories makes it easy to pair with your chosen outfit of the day. You can wear it with black, white, blue, etc. or for office, party and hangout! How awesome is that? 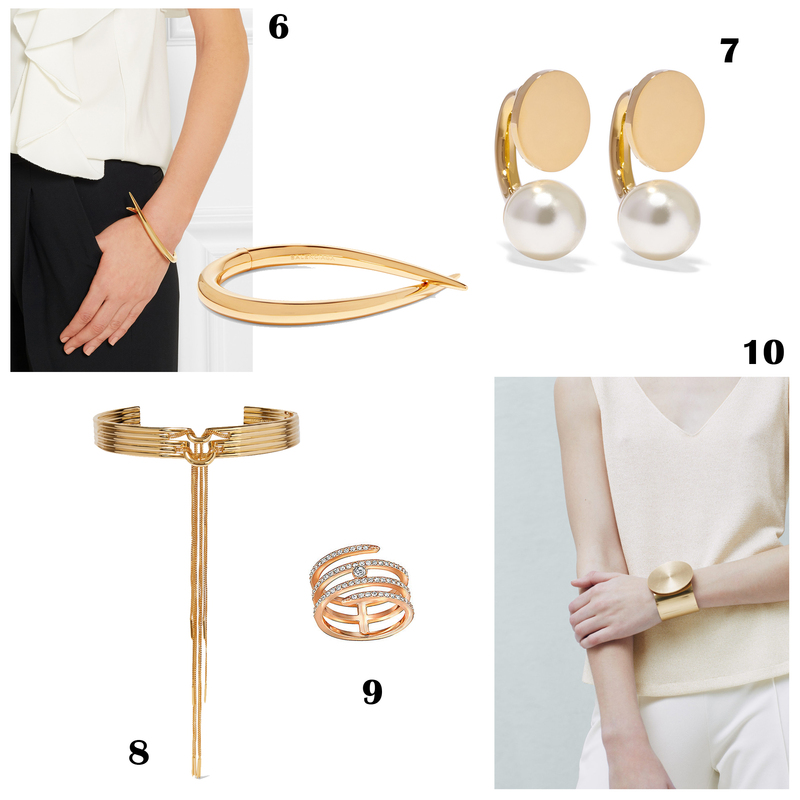 So here are my top 10 chic gold accessories picks! Tell me your favorite accessories on the comment box below! 1. Juste Un Clou Bracelet, Cartier. 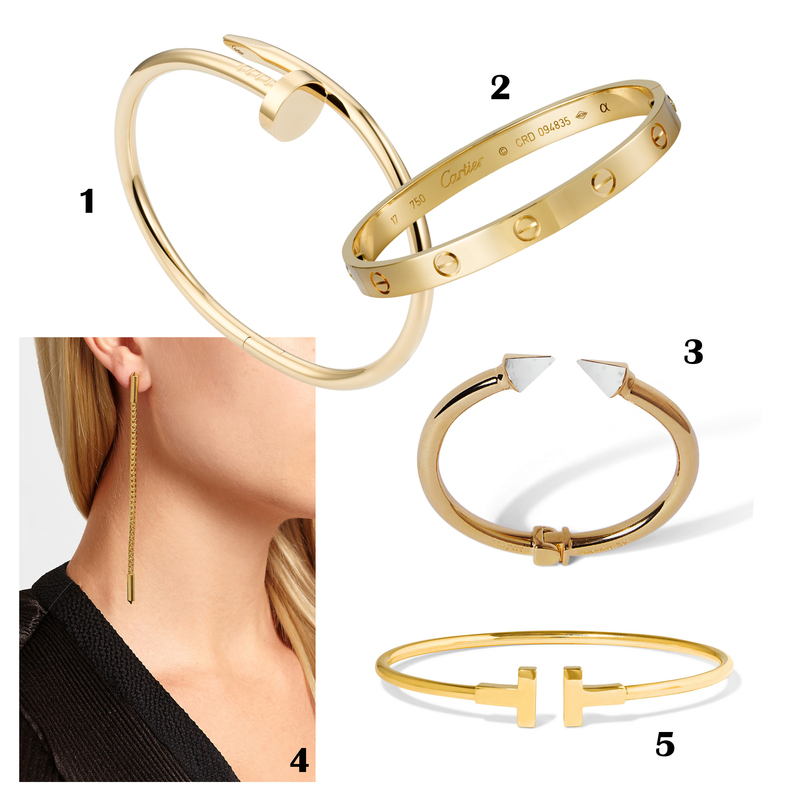 Stacking two of Cartier babies would make the best armparty! The marble detail makes this bracelet stands out and compliments your overall look. 4. Idle Line Gold Pleated Earrings, Eddie Borgo. Clean and straight lined earrings definitely gives an illusion of better face figure. 5. T-wire Bracelet, Tiffany & Co.
For you who doesn’t fancy a sharp edges, Tiffany & Co offers this in 3 sizes. T-square which is medium size, T-cuff which is the widest one and my pick is this T-wire which is the skinny one. 6. Gold Plated Bracelet, Balenciaga. A clean, simple and dynamic bracelet with sharp edges. I definitely crave for this one! 7. Darcy Gold Tone Swarovski Pearl Earrings, Chloé. Chloé knows best how to give a ladylike impression with those pearls. 8. Neo Tasselled Gold Plated Choker, Eddie Borgo. Eddie Borgo is killing me with its’ statement choker. Pair this with your favourite V-line dress and you’re ready to attend 5 stars event. 9. Creativity Coiled Ring, Swarovski. A little bling on your finger, oh girls don’t you want it? This is the go to casual accessories for basic look! Nothing crazy but gives your arm some cute details. I really like no 10, it so me… I will start looking for that this weekend. Thanks for your inspiring article. reasons for that choice too. First, Adidas have several raw materials extraction factories in The Americas.